reating call sheets is time consuming, complicated and necessary. 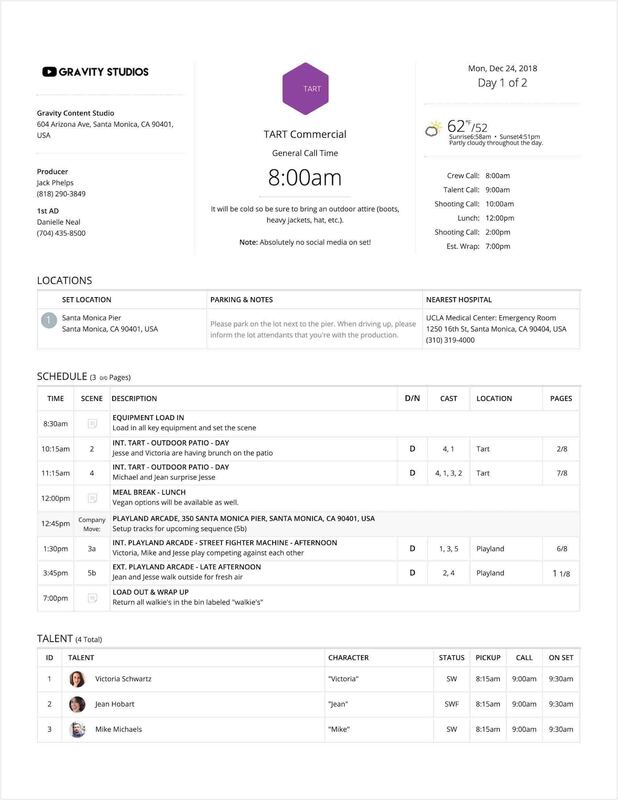 But what if you had an easy to use call sheet template that you could apply to all your projects? What StudioBinder offers is a simple and clear way to create, send and track a call sheet template online. In this post, I’m going to show you how to make a call sheet in a fraction of the time. How to personalize the call time for a call sheet recipient? A call sheet is the who what where and when for a single day of a film or TV production. A good call sheet will lay out all the work for the day, and most importantly help your cast and crew complete that work. Organization and clarity are key. These are things many come to know when they first learn how to make a call sheet, but with StudioBinder’s software, the call sheet will come organized and clear right out of the gate. Here is a look at a complete call sheet made with StudioBinder’s software. Take a quick glance and then we’ll go over the whole process step by step. Now that we’ve had a look at the finished product, let’s jump right into the process. How to make a call sheet? The basic formula of the call sheet is consistent enough across many templates. But there is a catch. Every single shoot has different specific qualities. How do you confront the countless shifting requirements with one call sheet template? Studiobinder will take you through the easy process of how to make a call sheet, step by step. You'll be able to select the type of shoot as well. We'll select “shoot day” for this call sheet example. Next you'll have a chance to decide who needs to receive this call sheet. You can either choose from the project's pre-existing contacts, or enter brand new ones. Creating contact lists in Studiobinder comes in handy here as well. Since we’re creating a sample call sheet here, we’ll go ahead and create some new contacts. 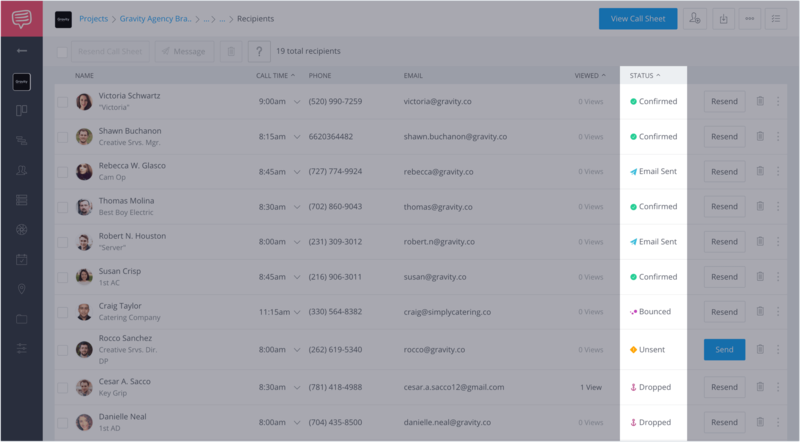 Your new contact can easily receive future call sheets and updates. 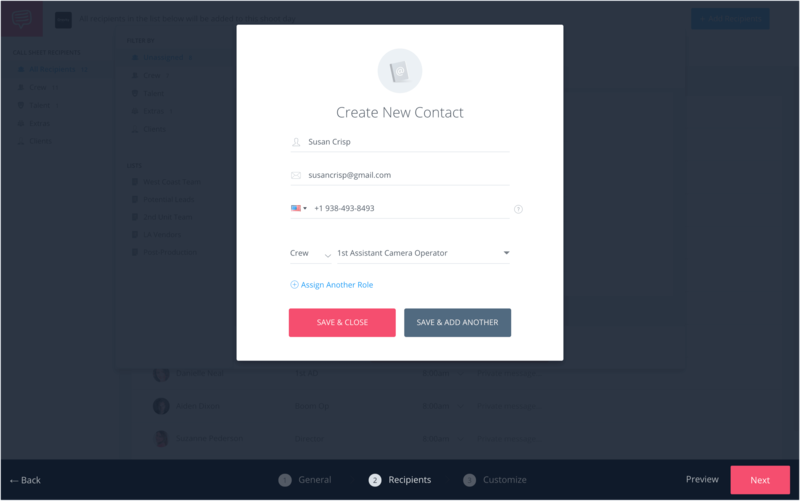 When you create a contact in StudioBinder, you enter all their contact information. A drop down menu will allow you to select if they are part of the cast or crew. Another drop down menu will allow you to assign the contact a position, or character name. This up front organization will make creating the rest of this call sheet much smoother. 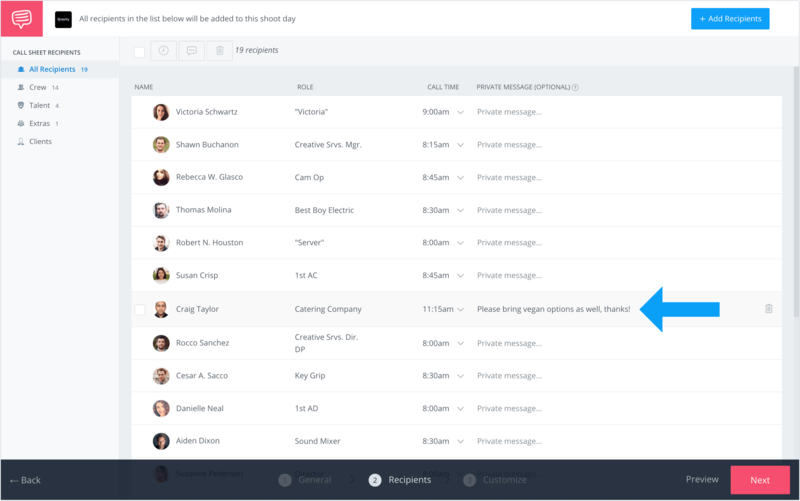 Future call sheets for the same project can instantly add all the same contacts, which will save you a ton of time. Another excellent feature available here is that you can add a private note that goes out with the call sheet. Say you want to remind the caterer to bring vegan option to set. That no longer needs to be in a separate email, or even worse sent out to everyone else as well. Make it a private note just to the pertinent crewmember. On the meat and potatoes. Once you click on Customize you will be taken to an online call sheet template that you can fill out. StudioBinder does all the layout work for you. All of the sections you’d expect to see on a professional call sheet are here – all you need to do is populate the fields. Call sheet example: Weather is auto-populated based on shoot location. Huge time-saver. Note that you can save you call sheet templates, and easily swap between them when creating the call sheets for future projects. The best part? Much of your key information is already entered. General call time is front and center in large print, as it always should be. Here you can edit which primary crew members appear in the upper left box. It's always a good idea to have someone from the AD department listed here, along with their phone number. 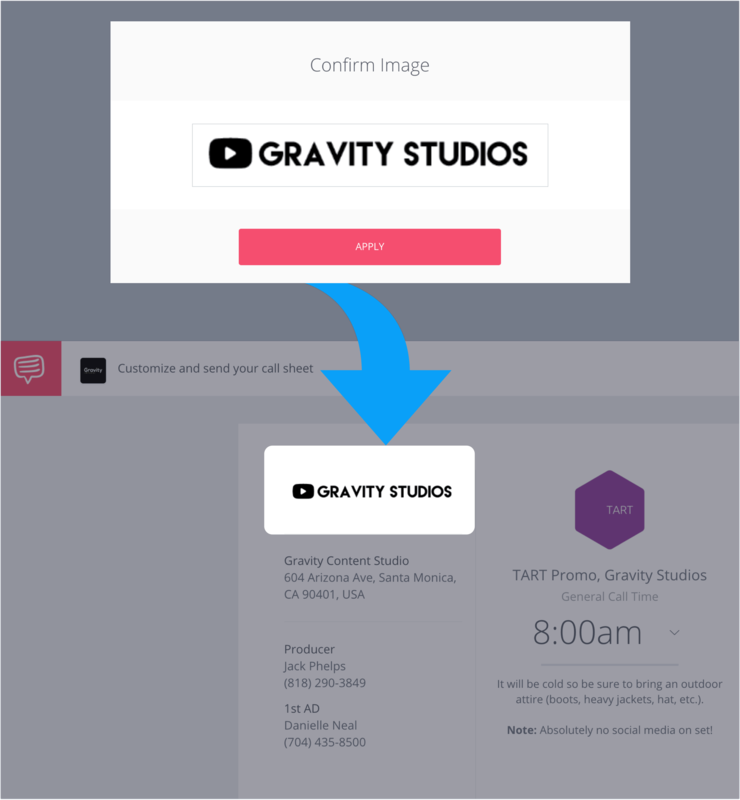 StudioBinder’s call sheet software also allows you to update the production company logo in the upper left as well as on the upper center of the call sheet. Under the section titled General, call time is a spot for “Special Notes”. This is an excellent place if you need to communicate anything specific to the cast and crew. Everyone's eyes will go to the call time first, so make sure to utilize that area underneath it. From there you can add more important times for your day. You can distinguish between crew call time and talent call time, so why not add them both right up top. It's also nice to let everyone know when the production will break for lunch. 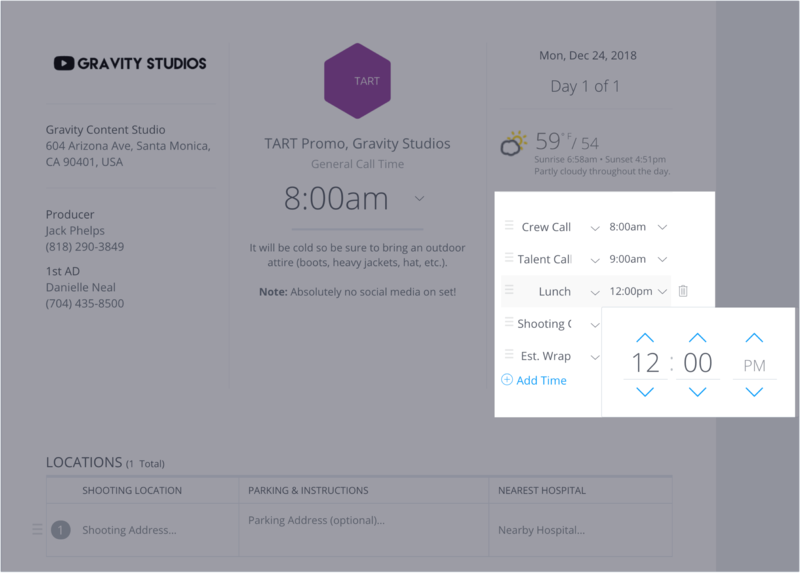 With just one click easily adjust the call times for talent and crew. This and other options, are all available to you when you customize the top right section, and can answer some of the most common on-set questions. You will also likely want to customize the call time for the actors in your cast. After the when comes the where. 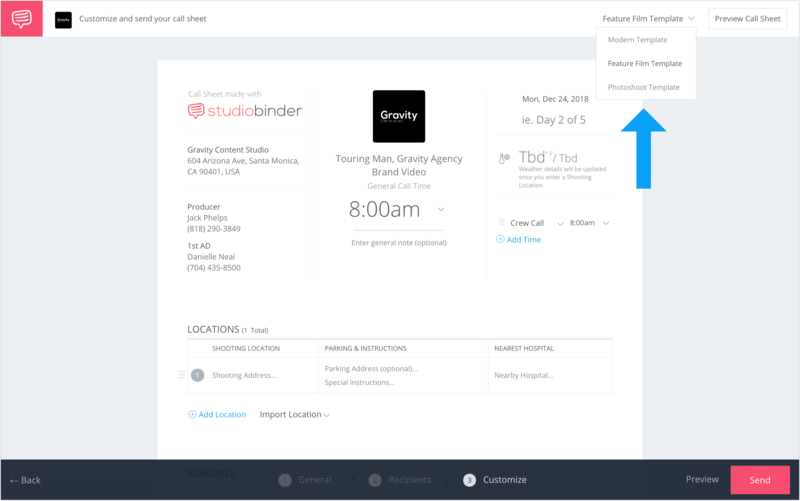 StudioBinder place the location box near the top of the call sheet template. Once you start typing your location's name or address, StudioBinder’s Google integration will auto suggest physical addresses to will become maplinks for call sheet recipients. Secondly, weather, sunrise, and sunset, staples of many a call sheet, will show up as soon as you've entered a valid location. All of this information arrives quickly in this simple call sheet template. What is a call sheet without a shooting location address? The answer is: pretty useless. Next to this will be parking and nearest hospital. No good call sheet can omit either of these things. Clear and concise parking locations are CRITICAL to a smooth shoot. Be sure that the hospital you enter is a 24 hour emergency facility. Not every hospital will have that type of facility. A little bit of advanced research can prevent a crisis. You may not need every cast member at the same time, so stagger them. The same goes for the crew. A great example of this is to call the Hair and Make-up department at the same time as your cast. Hair and Make Up won't have much to do until the talent shows up, and this is just one example of all the ways this call sheet template can be customized for each individual called to set. 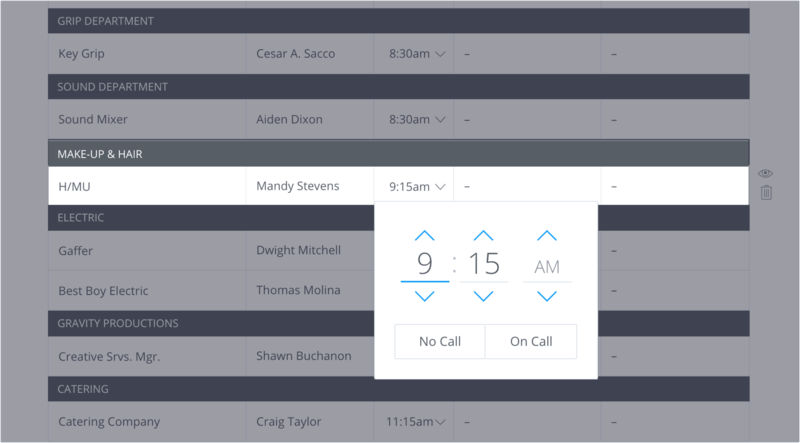 StudioBinder makes it easy to adjust call times for every recipient with a few clicks. Key hair and make-up can typically be called a little later than your DP, for example. Say, for example, you left some contact info on there for the EP by accident. Innocent mistake. But if it goes unnoticed you may soon be on the receiving end of a “You’ll never work in this town again!” speech. Click on Show / Hide Details eyeball icon to make those types of changes for every individual on the call sheet. 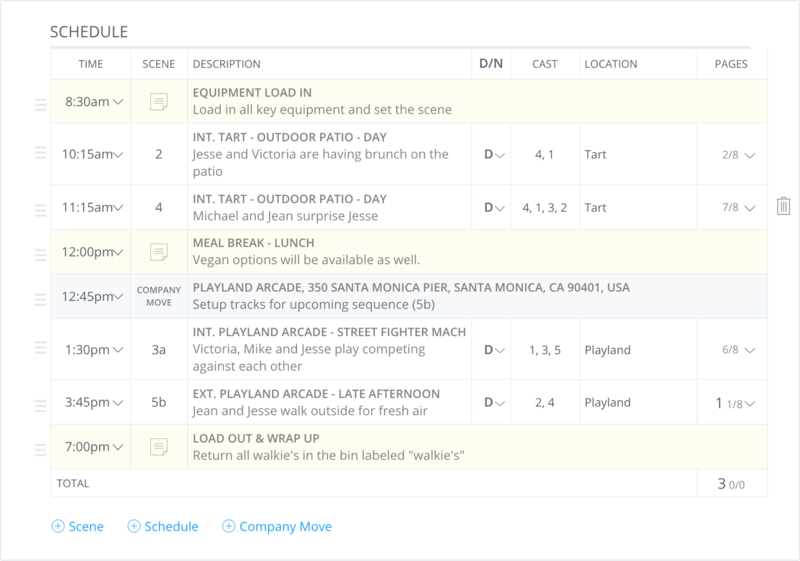 It's possible your project already has a schedule you created using StudioBinder’s shooting schedule builder. In that case you can import it, and your call sheet will have all that information. If not, the call sheet template will allow you to create the shooting schedule within it, and it's very easy. Click + Scene or + Schedule or + Company Move to add a new row. When creating a scene, include the time you'd like to start rolling. It’s always smart to give things more time than you think they’ll need. Because you’ll always end up needing more time. Then include the scene number, a brief scene description, day or night, the cast, and the location. You can include or skip whatever you wish. Every field is optional. If you want to remove the row, hit the trash icon on the right. Do you have specific details about lunch? Is it a walkaway? Whatever your details may be, add them in. Suddenly this how to make a call sheet walk-through has shown you to to include a valuable shooting schedule. Keep in mind that there are varying rules regarding meals and meal policies. For example, SAG has specific guidelines regarding meal times. By now you've got the nuts and bolts of any good call sheet covered, but the customization doesn't need to end there. This is a great chance to list every important departmental need you expect. What if your art department has specific pieces required today? Go ahead and add them in under "Special instructions." Specific key props needed? Mention them here, and make sure nobody forgets them. The more specific your call sheet can be about the day’s work, the more effective it can be in helping your production make your day. Your ability to pack in the details, while keep things clear and professional looking is an invaluable service to your production. Most call sheets will include a picture of a map of the location. StudioBinder’s call sheet template provide room to do this and more. You can upload up to 10mb of files and they'll show up at the end of the call sheet. In some instances you might use this feature to attach sides for the day's shoot, or a crew parking map when filming on location. You might attach a menu if lunch is being ordered. Maybe it's day one and you need waivers or documentation signed. Attach them here. There is no better way to convey information than on the call sheet. Once your call sheet is perfect. Now you can send it out. But you shouldn't do that before you've gotten fresh pair of eyes to confirm everything looks solid. Even people who have no idea how to make a call sheet may spot one or two errors or omissions you’d want to address. Sometimes an AD department is large, and the 1st might need to check the call sheet before it goes out. Or maybe there is an executive who wants to take a look. Call sheet approval on features and television is a little different than call sheet approval for short-form, music videos and commercials. 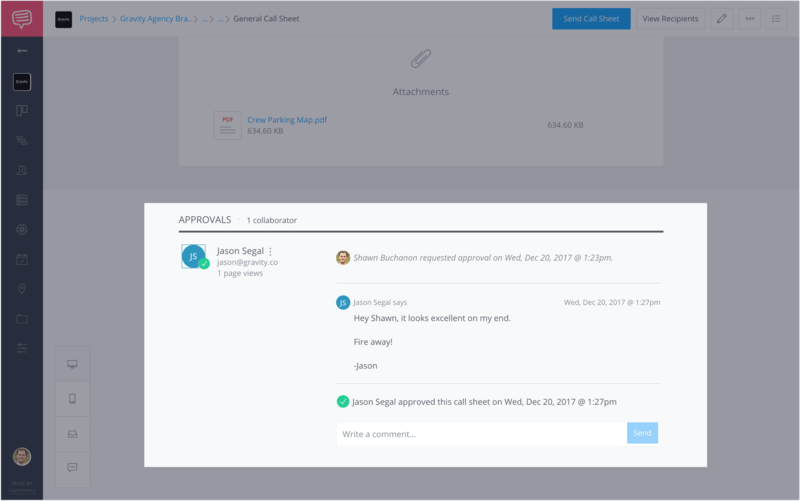 In either case, Studiobinder also a built-in call sheet and client approval system to help with the process and document sign-offs. 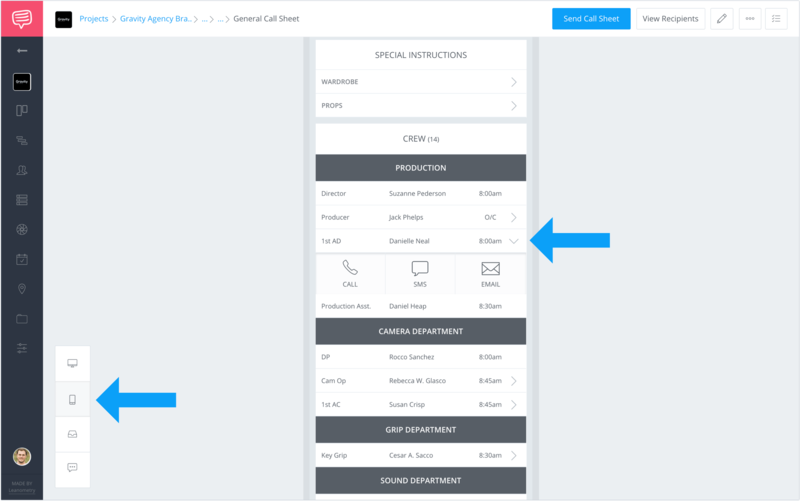 Once you’re ready to send out the call sheet, you can send it out to everyone by clicking the Send button. Alternatively, if you want to send the call sheet to specific recipients, you can do so via the View Recipients page. StudioBinder will let you know who you’ve sent drafts to already. Just find your list of call sheet recipients, and click the Send button. The finished call sheet is also optimized for a mobile view for someone who opens it on their smartphone. The call sheet can also go out via SMS, which will show the call time and date, with a link to the mobile view of the rest. StudioBinder’s software hasn’t just shown you how to make a call sheet, but it’s also made sure your cast and crew can read it however they receive it. Small icons on the left allow you to view the call sheet as it will appear on mobile devices. When your cast and crew receive the mobile call sheet, they will be able to call, text, or email contacts directly from it. This eliminates potential confusion and opens the direct line of communication. So you’ve sent out the call sheet. You’re not done yet! You need to confirm everyone received it next! In the old days, you’d have to take out your trusty phone and call/SMS your recipients. 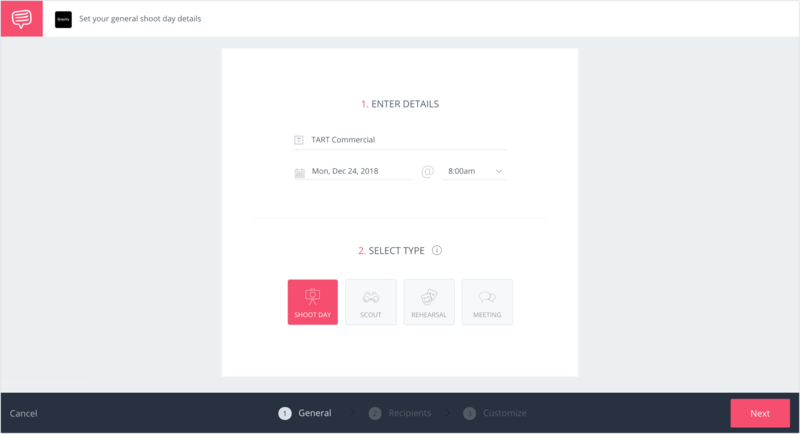 These days, StudioBinder tracks call sheet views and confirmations via a built-in RSVP feature. You'll know who has received the email, who has opened it, and most important, who has confirmed. No more concern about who got the information for tomorrow's shoot. Don’t worry - Your cast or crew don’t need an account to view or confirm call sheets, so it’s painless and saves your production a bunch of uncertainty. Uh-oh, some call sheets bounced! Now what? You may find you need to edit an email for someone, say there was a typo and the call sheet bounces back. Making call sheets is a critical step to any production, of any size. The quality and clarity of a call sheet will go a long way towards making the production smoother, and everyone involved happier. By using the StudioBinder call sheet software you’ll be able to churn our highly customized and detailed call sheets in less time than ever before. You can read more about making call sheets here. But you can do even more than just read about it. You can start learning how to make a call sheet with StudioBinder Call Sheet Software right now.